If you drive by the town green Route 66, you will notice a white building next to the library. This is the Old Town Hall. It used to be the Town Hall at Hebron, Connecticut before the new town hall was built on Route 85. 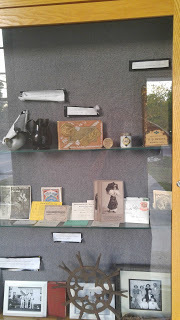 Now, the Old Town Hall includes many historical artifacts serves as a museum for the town community. 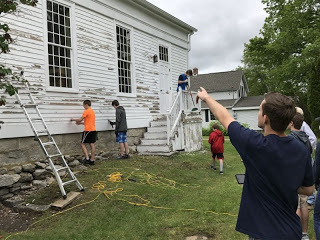 Various Boy Scouts throughout the years have dedicated their time and service to help the Historical Society repair and upkeep various parts of the building. The Historical Society has maintained the Old Town Hall since the town of Hebron gave the Society the rights to the building in the 1960’s. But what is the history of the Old Town Hall? When was the building first erected? It was the Methodists who were responsible for providing Hebron with its first site for town meetings. In 1828, the Methodists decided to hold services in the center of town. They chipped in around $100 while the town of Hebron paid $260 toward the construction of a second floor on the new Hebron Center School. This upper section of the school house was to be shared by the church for its religious gatherings and the town for its town meetings. The shared building worked for ten years until the Methodists decided they wanted their own church, which would be their third meeting place since coming to Hebron. The Methodists built their new church a few hundred feet east of the Hebron Center School. The deed for their church is in the Hebron Land Records, filed with the town for December 1st, 1838. In 1845, the upper floor framing let go during a town meeting held at the Center School, and the town was then without a meeting place. The Methodists offered the basement of their new church for the town meetings. Around 1850, the Methodists broke apart. They also had constructed another new meeting house, effectively disbanding the 1838 building they used as their church. In 1859, the town Selectmen of Hebron negotiated with the Methodist Society to purchase the 1838 building to use as the Town Hall. The old Methodist Church was negotiated for $650. Around 1863, the possession of the deed secured the building for the town of Hebron. At the end of the 19th Century and into the beginning of 20th Century, the Old Town Hall had some memorable moments in history. In 1875, the building was somehow lowered from its original two-story to a story and a half. In 1928, electricity was installed into the Town Hall. 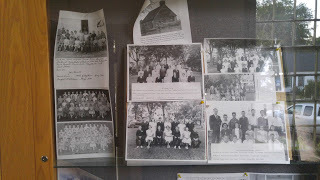 And in 1942, the hall underwent repairs and redecoration in preparation for the commencement of Hebron’s 8th grade students. Following the building of Hebron Elementary School in 1950, the Town Hall ceased to hold its town meetings. It was then used for other civic organization meetings. Soon, the Historical Society had been formed, and the members of this group started to restore and maintain the old 1838 Methodist Church until the building became their own. Over the years, the Old Town Hall has shown its wear and tear, and it was the Historical Society who needed to upkeep the building, despite being a nonprofit organization. The first renovations done on the roof were in the 1990’s where cedar shingles were replaced. Although this held up for twenty plus years, it came to a point where the roof once again needed to be replaced. The Historical Society in 2016 created the “Raise the Roof” Campaign where they raised money to repair the roof once again. The money contributions came from businesses throughout town, such as Gina Marie’s and Ted’s, as well as through generous donations from several individuals. Within three months, $10,000 was raised in contributions, with some businesses and individuals contributing $50 to $1000. It was then decided that the roof should be replaced with asphalt rather than cedar shingles. Asphalt roofs can last up to fifty years as opposed to cedar shingles, which had lasted us roughly twenty years. Asphalt also costed much less than cedar. With the approval from Historic Properties Commission, it was agreed that the Old Town Hall should be replaced with asphalt. On August 29th, 2017 Klaus and Larsen Roofing Contractor LLC, a local roofing repair crew came to replace the roof. This video posted below shows the replacement made on the roof, all of which was completed in a single day. The Historical Society was honored to have a local business (Klaus and Larsen Roofing Contractor LLC) to offer a quote to repair the roof. All the hard work and fundraising seemed to be done, except that was still more to do: paint. The exterior north and east sides of the building are in need of prep and paint. The campaign for the Old Town Hall continues to raise money to paint these designated areas and maintain the building’s foundation. 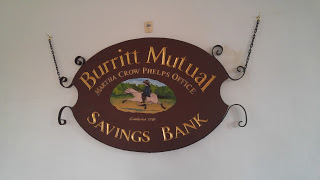 "Burritt Mutual Savings Bank Martha Crowe Phelps Office established 1889"
If you would like to learn more about the Historical Society’s Capitol Campaign or are considering to give a donation to support the cause, please check out the Hebron Historical Society’s website. 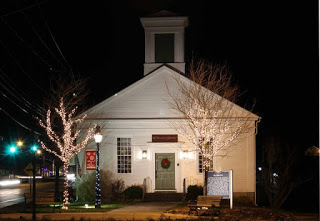 The Historical Society continues to maintain and preserve the Old Town Hall to cherish our town’s history. 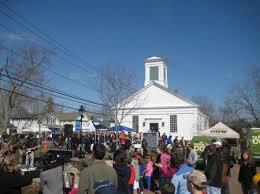 Please come and visit the Old Town Hall during the annual Maple Festival and other Hebron events! 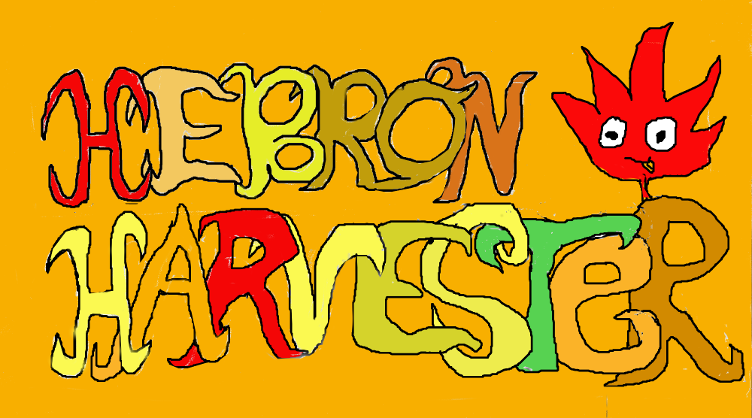 As always, feel free to comment and send your stories to hebronmapleleaf@gmail.com.